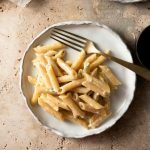 Perfectly cooked al dente penne pasta tossed with a super quick and Creamy Gorgonzola Sauce. This sauce can be used in so many ways like over a juicy chargrilled steak or baked into a potato gratin but it's especially good tossed with pasta for a simple and comforting weeknight meal! Bring a large pot of salted water to a boil and cook the pasta until al dente. Make sure to serve 1/3 pasta water. Meanwhile, put the milk and butter in a large deep sided skillet or pan and heat until the butter has melted. Once the butter has melted add the gorgonzola and stir until melted. Add the cream and 1 tbsp parmesan with a a good pinch of pepper (around 1 tsp freshly grinded) and a pinch of salt. Cook the sauce until the pasta is ready (around 3 minutes) and then add 1/2 cup of pasta water. Add the cooked pasta and toss until evenly coated, serve with an extra grating of parmesan. Don't overcook the pasta, for al dente you should cook dried penne pasta for around 8-10 minutes. Every brand will be slightly different but always check your pasta after 8 minutes and keep an eye on it because overcooked pasta is the worst! Choose Gorgonzola dolce and not piccante. Leave the gorgonzola out of the fridge for a few hours (4-6) if possible you will notice a difference in flavour but if you can't manage it you can still use it straight from the fridge. Add the pasta to the sauce, not the other way round, you want the pasta to soak up every last drop. The sauce should just coat the pasta and there shouldn't be any runny creamy sauce swimming around at the bottom. If the sauce is too thick for your liking add a little more pasta water. Don't be tempted to add more cheese or cream or the sauce will become too rich and sickly (I've tried). You can make the sauce in advance and let it cool and store in the fridge. It will probably thicken so add a little pasta water or if not making it for pasta add a touch of milk to loosen it. The pasta is best served immediately.